The largest convention center in North America, McCormick Place in Chicago hosts a diversity of conventions, expos, trade shows and meetings in the heart of the Windy City. 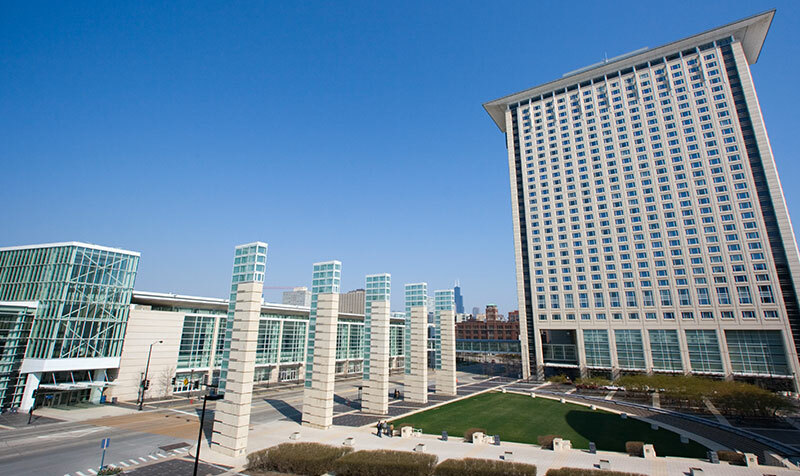 Located just minutes from downtown Chicago, McCormick Place is comprised of four state-of-the-art buildings with over 2.6 million square feet of exhibit halls, 170 meeting rooms, 600,000 square feet of meeting space, and six ballrooms - two of which are the largest in Chicago. The McCormick Place campus also boasts the 4,249 seat Arie Crown Theatre, pedestrian promenades and sky bridges, and 5,800 parking spaces. The Grand Concourse and the Central Concourse also feature shops, cafes, restaurants and many visitor amenities. McCormick Place is the annual home of the many exciting events, including the Chicago Marathon Health & Fitness Expo. Hotel Versey enjoys easy access to Chicago's premier convention and business destination. Is there a coat check or baggage storage at the McCormick Place? yes. Enjoy doing business or attending a trade show at McCormick Place without any hassles. Permanent coat check areas can be found at Gate 4 in the South Building and at the Transportation Center in the West Building. In addition, coat check service is usually provided for most shows. See the specific event listing for the details. Is there dining at McCormick Place? You will never go hungry at McCormick Place. The concourses offer several concessions, restaurants and cafes with international cuisine, from grilled hamburgers and paninis to pastas, gourmet pizzas, sushi and homemade desserts. You'll also find Asian noodles, hummus, fresh veggies, snoothies, and Chicago-style hot dogs. Enjoy diverse dining at the South and West Hall Food Courts, La Brea Bakery Cafe, Starbucks, McDonalds and Connie's Pizza. Find out all the dining options here.